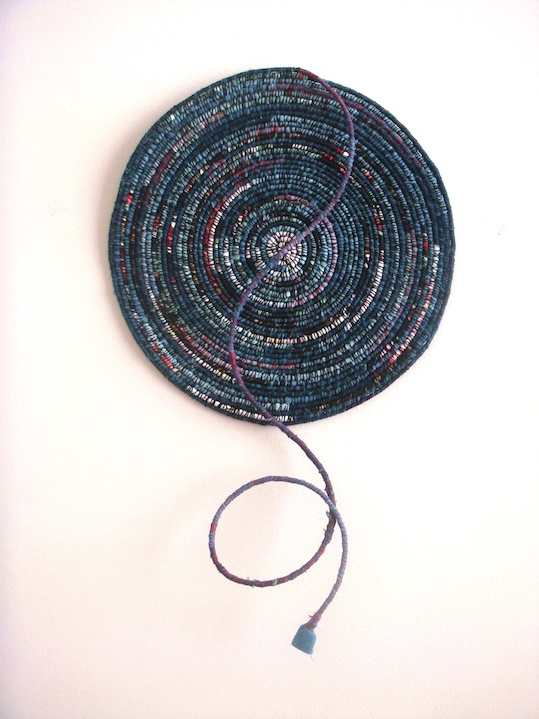 Indigo, basketry and the quest for inspiration. Barbara Shapiro has just published an article for TextileArtist.org, in which she explains her philosophy of finding inspiration, and the advice she gives to other artists. Artistic inspiration, especially for textile artists, can come from materials, techniques or concepts. Materials are what inspire most beginning weavers, the yarns themselves being so seductive. As we grow in our mastery of various techniques, our work becomes more complex and interesting. Eventually, when the techniques become second nature to us, the personal rises to the surface and the conceptual underpinnings of our work shine through the other two elements, now part of our vocabulary, to speak in the artist’s true voice. At least, that is how it worked for me. I offer my students exercises in materials, technique and concept and encourage them to find what moves them into producing fresh, personal and meaningful work. The article goes on to mention specific bodies of work and to explain her concepts and process for each. There are many great links; one to Barbara’s class she teaches Sources of Inspiration, as well as a published text of a presentation she gave at the TSA Symposium. Thank you Barbara for this wonderful article, an opportunity to hear your own private artistic thoughts, and a great mention of the World Shibori Network! This entry was posted on 3 September 2013 by World Shibori Network.